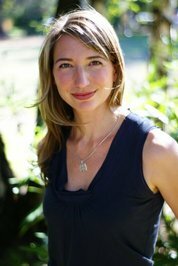 Dropping in today is Don't Turn Around author Michelle Gagnon to discuss her new book, her writing process, and dinosaurs. What would you do if you found yourself strapped to a bed with an IV in your arm, and no memory of how you got there? I’m prone to freaking out, so the first few minutes would definitely be spent having a good old fashioned panic attack. After I finished hyperventilating, I’d like to think that I’d have the presence of mind to remove the IV and get the heck out of there, but doubt that I would have been as self-possessed about it as my heroine, Noa. Hmm, that’s tough—like trying to choose a favorite child. And since I have both a hero and heroine in the story, I’d feel terribly guilty picking between them. But as far as the supporting cast goes, I love Cody—he’s so sweet, and the way he comes through for Peter, serving as a surrogate brother for him, was lovely. A few of the characters who basically have walk-on roles were a lot of fun to write, too—especially Otis (the geeky college student who helps Noa in the library) and Pam (Cody’s downtrodden downstairs neighbor). What was your drafting and revising process like for Don't Turn Around? If you could pair Noa and Peter with any character from any book, who would you pick for each? Another tough one! Okay…I think that Peter would get along really well with Alex from Katie Crouch’s Magnolia League series. Despite their different upbringings, they both have a laid back approach to life and a wacky sense of humor. Noa’s the tricky one, since she doesn’t generally play well with others. But I think that she and Perry from Veronica Rossi’s UNDER THE NEVER SKY would really understand each other. An alligator, because they refused to become extinct when the rest of their species perished. I’m all about perseverance. Thanks, Michelle, for stopping in! 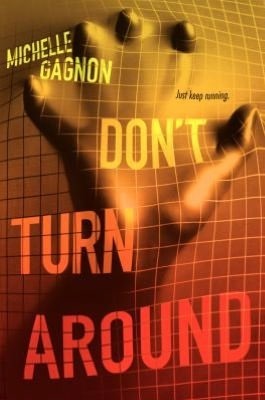 Want to know more about Don't Turn Around? Check it out on Goodreads and add it to your shelf! And be sure to find Michelle over at Reading Lark for another interview! Hmmm, looks like a great book. I think I've added it to my list and probably forgot about it, but hey! Its there. I would really like to read it. Dinosaurs<3 I never knew alligators were dinosaurs, that shows how much I pay attention in class.